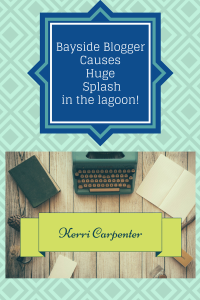 Bayside Blogger Causes Huge Splash Over Sparkly New Romance Novel! Hi there, Waterworld Mermaid Lagoon. Bayside Blogger here. My little gossip birdies (you know who you are) tell me that one of these so-called “Mermaids” has a new book out. That’s right. Nora Roberts-wannabe, Kerri Carpenter, just released Falling for the Right Brother. Who wants to fall for the right brother? My cute little stiletto-wearing self would more than likely go for the wrong brother. Wink, wink. Rumor has it Kerri wrote two more books in this series. Even bigger rumor is that this series is all about…moi. Gasp! Now, who would be interested in little ole mascara-clad, gossip-loving, fabulous me? Snort. The real question, dear Mermaids, is who wouldn’t be?